Berber carpet problems are most common with the cheaper fibers used to make the Berber-style carpeting. Olefin and PET fibers have the worst track record and reputation for Berber carpet. Some problems with Berber carpet can be reduced, and maybe even avoided, with careful and frequent care and cleaning. Keep high heels and long pet toenails away from Berber carpet. Clean stains immediately. And consider wool or nylon fiber for your Berber carpet. What is the most popular choice for carpeting today? Berber carpet. This carpeting is installed in new homes more often than any other carpeting on the market. It is important, however, that you learn more about Berber carpeting to ensure that you are getting the best value for your money and so you do not run across many of the common Berber carpet problems. Berber is the style of the weave of carpet, rather than the fiber, so it is important that you choose the right fiber of Berber carpet for your home. Fibers are the most important part of any carpet. Several different fibers are used in making Berber carpet. Choosing quality fiber for your carpet can help you avoid having many of the problems associated with Berber carpet. Wool and nylon Berber is highly recommended for many reasons over the olefin, PET (recycled pop bottles) and other kinds of Berber carpeting. If you buy quality wool or nylon Berber carpet now you could be saving yourself money and heartache in the long run because they are more durable than other fibers. What are some problems with Berber carpet that is not 100% nylon or wool that consumers talk about? One of the most common problems with Berber carpet, especially the non-wool or non-nylon fibers carpets, is the difficulty in removing stains and keeping the carpet clean from normal wear and tear. It also has a tendency to turn grayish, yellowish, or brownish after cleaning. It may look beautiful and appealing on the roll, but if it is not 100% wool or nylon Berber carpeting then you will probably not be satisfied with it in the long run. Another common problem that occurs in olefin Berber carpeting is attributed to its low flashpoint. This means that it has a low tolerance for things like furniture being drug across it. Sometimes something as simple as scooting your couch or ottoman can cause scorch or melt marks on this inferior carpeting. Scorch marks are impossible to remove from anything, including carpeting. And once melted, there’s nothing that can be done to resurrect it. Berber carpet problems can also include raveling. This can occur if you have pets that get their nails caught in the loops or if a high heel catches a loop of the Berber carpeting. Once you have a loop that has come out of the carpet backing, you are likely to have the entire carpet unravel. Another thing that can be a problem with Berber carpet is the feel of it. The 100% nylon or wool carpeting will feel soft to the touch, but the other kinds may feel scratchy, rough and hard. If you have children who crawl around on the floor, this can be a huge sticking point with you. Inferior Berber carpeting fibers can also be crushed more readily and will not regain their shape. This usually occurs when furniture is put on the carpeting and left for a while, but can also occur with normal traffic, especially on stairs. Frequent cleaning will reduce the crushing problem, but it’s still only a matter of time before the inferior fibers lose their life and oomph. Learning about the problems that can occur with Berber carpet will enable you to make a more informed decision about this investment in your home. Most problems can be attributed to the inferior olefin or PET fibers, though, so if you choose quality 100% nylon or wool Berber carpet then the problems should be few and far between. We rented a home that has Berber carpeting (big mistake) we went to have it cleaned by a professional rug cleaner . The cleaner did a beautiful job cleaning, there were some little stains on the rug and he cleaned it with some chemical to remove the spots. Well by the next day we start to notice brown blotches all in the living room and hallway. We called the cleaning company back who returned the next day. When the cleaner saw it he did not want to believe how it ended up looking like that. He insisted it was pet stains so he used pet chemicals and cleaned it for us. When it dried the stains reappeared and newer stains appeared. Well, we called the cleaning company again, this time to pull up the rug to see what kind of stains was under the rug. There was no stains of any kind, Pet stains or Pet oder. Well now the property manger is involved and the carpet company men came to check the problem, they are going to have someone come out and test the area where the blotches are. We were told that the rug was made of nylon, and not Olefin. My question to you, have you heard of such a situation like this before? I HATE BERBER ! It’s called carpet browning and there is a carpet stain remover specifically made for debrowning, you can do a search for Carpet Debrowner. I would recommend testing in an inconspicuous area first to be sure it doesn’t damage the Berber. However, I do always suggest to try StainSolver for all types of stains. It is much safer than harsh chemicals. When we first moved in, we decided to make a no shoes house rule to keep the floors clean. Much to our surprise, just a few short hours after moving in, the bottoms of our bare feet were completely black! We contacted the property manager who told us that the carpets had already been cleaned twice but agreed to do it a third time. I made sure to watch when the maintenance men cleaned, and sure enough a lot of dark-colored water was poured out of the machine after cleaning. But alas, our feet still turned black! At this point, the property manager has suggested it is the carpet dye, which is no comfort. So much for our no-shoes rule; we have decided to keep our feet covered until a solution is found. Has anyone had or heard of a similar issue? I cannot decide whether I think it is dirt of dye, but either way I am disturbed and do not know what can be done to fix the problem. I have not heard of dye coming out of a dry carpet (unless maybe if there was a dye used that wasn’t meant for carpets). However, generally when carpets are cleaned, they are cleaned until the water is clear – meaning the dirt has been removed. You could call a local carpet store and ask them if this is a known problem with that color of carpet. I just moved into an apartment where the carpet was alledgely new, and a light colored berber. After the first couple days I noticed the bottoms of my feet were black. I wore white socks and again walked around my apartment and again they were black? The pad under the carpet is black? I took my socks to the management company and they were baffled… Please – any information would be much appreciated and helpful. Thank you. That is somewhat baffling and certainly kinda gross! The good news is that I do believe the management is probably being honest that the carpet is new. However, I’d be really concerned about the carpet pad and subfloor underneath. Unfortunately, my best guess is that there may have been some moisture damage at some point in time and you are dealing with a mold or mildew issue. The mold and mildew may be seeping up from the old carpet pad into the new carpet. The first thing that will need to be done is to confirm if this is the case. To identify mold and mildew, the surest way is to take a sample of the carpet and send it off to a lab for testing. This is usually not especially expensive, but you may not be able to cut a sample as the renter. What I would recommend is that you pull up the carpet in an area where you could replace it easily and see what is underneath. Search some images online to compare and see if it looks like mold/mildew looks is what you’re dealing with. If the problem is widespread, unfortunately that will probably mean the new carpet is now also going to need replacing. 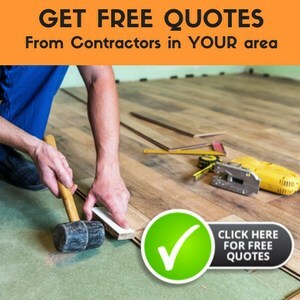 The entire carpet and pad underneath will need to be removed, and the moisture problem will need to be treated before a new pad and carpet are installed, or the same issue will resurface. The initial cause will need to be determined, too; if there was a flood of some sort at one time that was not properly treated, that will be easier to deal with than an ongoing leak or humidity issue. If the problem area is small, like there was a single leak or spill at some time that wasn’t dealt with properly, it may be able to be cleaned with a steam cleaner. However, it is so important to make sure the carpet and pad dry completely afterwards or the mold/mildew issue will be exacerbated. It’s also possible to pull up only the affected carpet and carpet pad area and replace only that with a patch, if the area is small. All of this will probably need to be dealt with by the management company, but it sounds like it could be a pretty big undertaking and, in my experience, management companies aren’t great at moving quickly on these things. Mold and mildew are serious, however, and can pose health concerns, so if that is indeed the cause of the mysterious black socks, you will want them to take care of the issue promptly or find a new place. Best of luck, let me know what comes of this all, and I am hoping that I am mistaken and it turns the cause is something much easier to deal with! bought Shaw berber carpet: Tuftex carpet, style: Bali. covered under warrenty. Any ideas.